This is the cool Prusa Super Switch – it interfaces to the mini RAMBo card and drives the four new extruders by multiplexing their step and direction signals over the original E0 connector. Clever. The filament racks are paired, so there are two of them. The four new extruders sit on top of the Prusa arch – again in pairs. The filament is delivered to the Y Splitter via four short Bowden tubes (ironically, I've been working to eliminate Bowden tubes from my delta printers!) you see in the lower half of the photo and here is a closeup view. The four filaments feed into the top of the Y Splitter and the g-code orchestrates the dance to advance the active filament and withdraw the retiring filament. Other than the space required for four spools of filament, the setup is very compact. Like anything new, there is a bit of a learning curve required. It is highly recommended that you have solid experience with single extrusion on your i3 before doing the MM upgrade. There are just too many new variables to control and without a firm foundation of success I fear frustration will be your friend. For my first attempt I decided to print the MM g-code for the Gear Bearing Prusa provides. I chose green, blue, white and orange filament. I have a lot of experience printing the green, blue and white but not much with the orange and it was a little persnickety at the time. This is important! I highly recommend finding four filaments that print very well with your stock i3 before diving into quad extrusion. In my case, I understand filaments and extrusion well enough that I believed I could deal with a relative newcomer filament. How wrong that assumption was! Assume that the printer is printing your first color – red in the drawing. When it's time to change to the next color the nozzle is moved to the prime block. 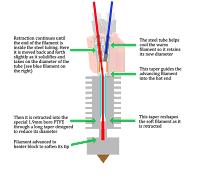 The nozzle is simply moved back and forth the length of the prime block as the filament is withdrawn up into the special PTFE tube (light blue). This tube is special in several ways – it is not standard 2mm PTFE, it has a precision 1.9mm ID. You can not replace this tube with standard 2mm PTFE and get good results. The lower end of the PTFE is tapered to help shape the soft filament as it is retracted up through the heatsink. 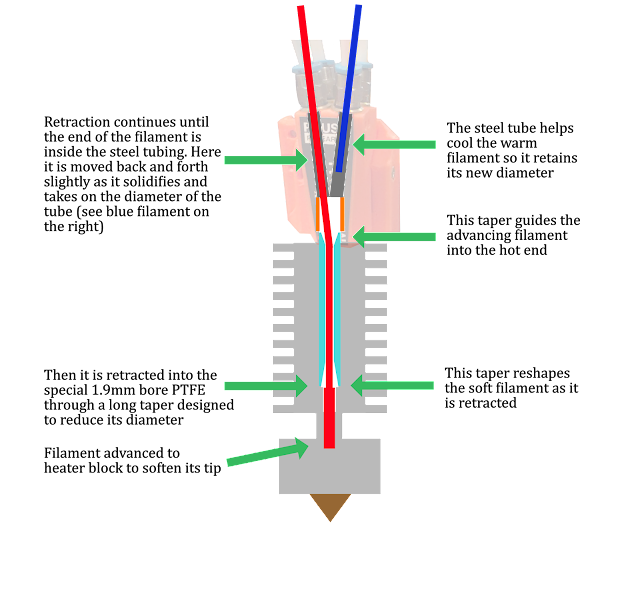 The filament retract continues until the tip of the filament is inside the steel tubing. This tube is a good heat conductor and quickly cools off the filament so it retains its shape – a precise 1.9mm diameter. While it is cooling, it appears that the g-code is jiggling the filament back and forth a little to keep it moving it as it cools. This prevents it from sticking to the tubing. When the red filament is completely withdrawn into its steel sheath, the next filament (blue in this case) is advanced. The upper end of the PTFE is tapered to guide the filament in. The filament continues its journey to the heat block where it is extruded on the prime block to purge the old color and prime with the new. An update: Peter(PJR on the Prusa forums mentioned below) emailed me after reading this post with a few well made comments. I'll just quote him, no use trying to wordsmith a clear description! The Y-Splitter is actually a multiplexer, although technically it should not be called that it does perform that function. The "SuperSwitch" is actually a demultiplexer. During the tool change, about 10mm of the previous filament is "rammed" into the hot end which has the effect of cooling the tip of the filament for clean withdrawal. Withdrawal must be fast, but not too fast such that a ball of filament is left behind (below the MUX). If the temperature is too high, then stringing will occur causing a blockage. A steady (or better, slowly increasing) purge speed allow the best possible purging of filament and uses about 60mm of filament. I have a feeling that the cooling tubes are actually 1.95mm internal diameter. The primarily tip forming is carried out by the PTFE. Early beta tests were using standard 2mm PTFE and 1.85mm cooling tubes; the tip forming was then carried out by the tubes. The problems may start when the PTFE start to wear. Simple right! What could possibly go wrong? It might be better to ask "how does this thing even work?" It does and quite nicely – once you understand the mechanics described above and the properties of the filaments you are using. PJR on the Prusa forums posted a well done Blockage troubleshooting thread that is a must-read for anyone upgrading to the MM kit. During my first print, the extruders were sounding out that tell-tale click-click-click of skipping steps. This is virtually unheard of for Bondtech dual drive gear extruders so something must be seriously wrong! Even a Bondtech extruder can't push filament through a wall – and that's the clue. In my case, that orange filament was not retracting cleanly and leaving a long string as it was pulled up into the steel tube (this is somewhat hypothetical although I did disassemble the Y Splitter several times during failed test prints to find a blob and string of orange filament in the bottom of the splitter). This blocked the next filament from entering the hot end. I replaced the problematic orange with a known good gold filament and was off and running making some reasonably nice multi color test prints. The above illustrates why its good to have some printing experience under your belt and choose four filaments that perform very well. The filament must be well behaved as it melts and cools during the change-over process – extruding at elevated temperatures is the kiss of death and will likely result in blockages as described in PJR's post. I don't have a lot of experience yet but I am over the initial learning curve and I'm starting to slice my own MM objects. Prusa provides a post processor for Slic3rPE but I'm using KISSlicer (the unreleased 1.6 beta 1 that should be out in the next week or so) and a post processor written by the same PJR mentioned above. It works beautifully. 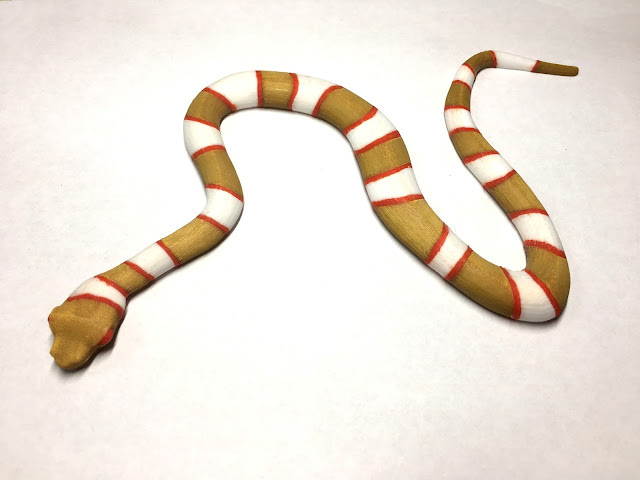 Here's a 12 hour MM snake I printed last night in gold, white and red PLA. This gold is known to string at higher temps and I forgot about that when I sliced. So I did have a fair amount of stringing of the gold. Next time I'll reduce extrusion temperature to 190° or 195°C for it. This print was 200°C, 3 perimeters, .1mm layers and 50% straight infill. 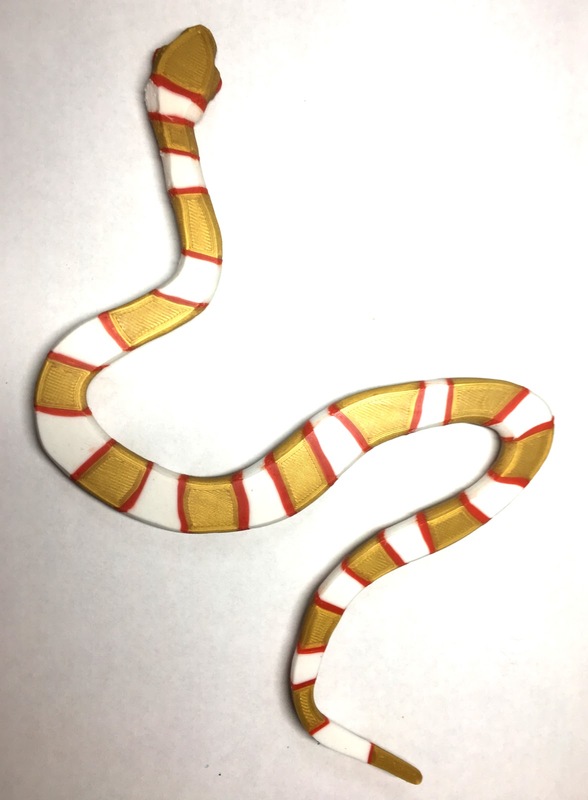 Here's the belly of the snake, not a bad first layer. 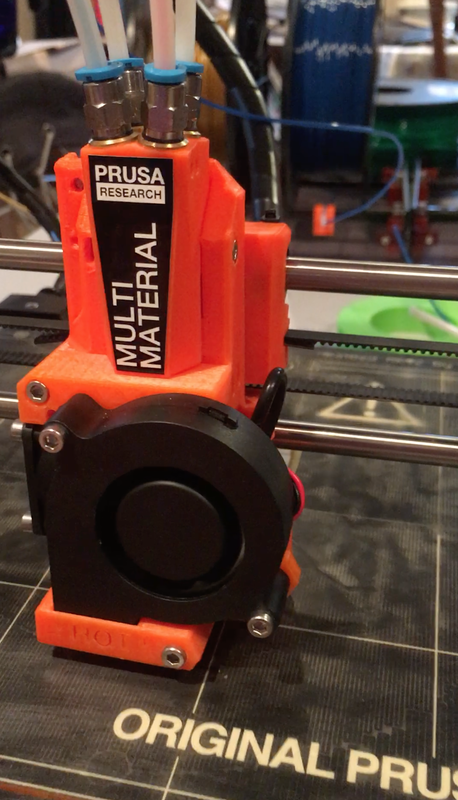 8 comments to ''First week with the Prusa MM Quad Extrusion Kit"
Amazing print Michael, thanks for sharing. Tonio, once you've done the quad upgrade, you are left with a very different extrusion system with 4 short Bowden tubes. Even these short Bowdens have a pronounced negative impact on print quality with stringing and blobbing issues. I have not been able to tune the i3 with the quad upgrade to the same level of print quality as I had with the single direct drive extrusion. So I've removed the quad kit and no longer use it. I replaced the extruder with a direct drive Bondtech QR on the original E3D V6 hot end. Now the printer is producing good parts again. The splitter's body is 3D printed but it has stainless steel tubes inserted into it. My experience with "Y" splitter type of multi-extrusion a few years ago was not positive so I moved on when E3D released the Cyclops. I also have the diamond (3 in 1 out). 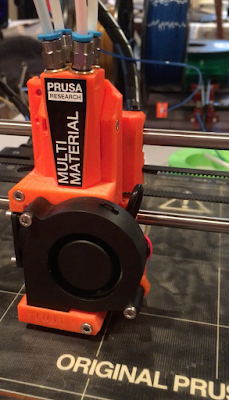 I thought the work that Prusa was doing with their multi-media kit made sense - they approached it holistically with the hot end, extruders, firmware and slicer - which, I believed, might result in a RELIABLE multi extrusion system. Unfortunately it does not. Sure, you can print some very cool multi color prints with it but I capitalized RELIABLE. I need my printers to be as near 100% reliable on EVERY print I make to be viable. If you are a hobbyist doing occasional printing for entertainment/fun this may not be important to you. I manufacture customized 3D printed fly fishing reels and reliability, reproducability and quality are absolute requirements for me. thank you for taking the time to document your experience. I am really glad I found your post on the PRUSA forum and then this blog. I was starting to go a little insane with the reliability issue of my MM. 2 out of 5 prints are fine and the rest are constantly skipping leaving me with air-prints. I will continue to tweak the print settings but I think I will also return to the single print mode. A real shame as I had high hopes (maybe unrealistic one) for the design. I've now spent a few days tweaking my Prusa MM upgrade and I am happy to report that I've been able to almost eliminate the skipping issue. 1) PTFE tube: I installed a brand new PTFE tube from Prusa. I ordered 3 just in case. No cutting or trimming of the tube. At first it appears to be a bit too long for the Y-splitter but I pushed the splitter down as far as possible and then secured it with the long screw in the back. 2) Finding the right temperature for each filament: On the old Prusa i3 MK2 (without bowden) I printed most of my filaments at the same temperature (circa 220C). It seems that with a bowden extruder the correct temperature makes a world of difference. For this I used the "better temperature tower" on thingiverse and printed off a tower for each of my filament spools. The results astonished me. Some PLAs happily printed at 195C while others started skipping at 215C. Now that I have all filaments setup in slice3r I haven't had a single print fail! And I've been printing for 4 days. Hope this solves your problems too! Thanks Tobias. The issue, at least for me, is that even though its worked for 4 days for you will it work for 40? In my case, I certainly can futz with it and get some very nice prints. Then things will stop working perfectly. I DEMAND near 100% reliability for my work and simply don't have time to spend when there are other options that meet my requirements. I also have a lot of printers so I'm not tied to committing to get one printer to work like a lot of folks might be. I have asked Prusa support. They have told me that the PFTE is exactly the same for the hot-end (MMU version) to all the other things that PFTE tubing is being used for. They only have one type according to this supporter? Who is right -and who is wrong?